Now with all of them on the far side of age 45, Deep Purple's Mark II re-unite for one final record, a full 23 years after their first album In Rock (1970). The Battle Rages On has a sprinkling of excellent songs and as a whole is a worthwhile listen, but it this is a band deep into the back-end of a stellar career. Still, the old magic sometimes shines through. Ian Paice's drum kit immediately sounds like it received an upgrade, with the drum sound finally thundering loud. Ian Gillan meanwhile emphasizes his tone rather than range, a logical transition into middle-age. Blackmore and Lord continue to carry the melodic load at the front, and on The Battle Rages On their emphasis is more on depth than speed. 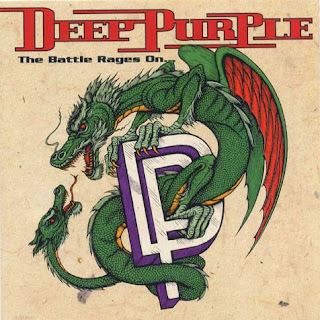 The title tracks opens the CD with a lot of muscle and intent, Deep Purple determined to prove that they are still capable of writing dominant songs. The Battle Rages On is worthy of the name, the song a suitable soundtrack for endless war and a bloody battlefield. Anya is the centrepiece of the album, a true bolt of inspiration, Purple harnessing their creativity for one more masterpiece, an irresistibly sinewy combination of emotive vocals by Gillan and rocking delivery by the band behind him, marshaled by Lord's keyboards. Ramshackle Man is a throw-back to old-school rock 'n' roll amped into danceable country metal, about as much energetic fun as a band can have in a middle-of-nowhere cowboy bar. And Solitaire is an excellent farewell, Purple playing almost against type with a subdued Gillan almost channeling more-modern Lemmy Kilmister while Lord and Blackmore lay down an epic downbeat melody that wouldn't recognize happiness if it tripped over it. The Battle Rages On has its share of lackluster tracks, but it contains enough good material to remind us that as a band, Ritchie Blackmore, Ian Gillan, Roger Glover, Ian Paice and Jon Lord were among the giants of metal. Produced by Thom Panunzlo and Roger Glover. Engineered by Bill Kennedy, Hans Gemperle, John Corsaro. Mixed by Pat Regan.